6. THE EFFECTIVE DATE OF THE BADGE IS 22 OCT 18, AS PER REF A. A CAF MEMBER WHO IS ELIGIBLE FOR THE BADGE, AKVE CURRENT AND EMPLOYED WITH TACTICAL AVIATION SHALL BE CONSIDERED AN AIRCREW MEMBER FOR THE PURPOSE OF AIRCREW ALLOWANCE MONTHLY AT REF D. AN AIRCREW MEMBER MAY BE ENTITLED TO THIS MONTHLY ALLOWANCE UPON SATISFYING ALL OF THE CONDITIONS LISTED AT REF D.
Qualification badge and AIRCRA on ops are both positive moves to acknowledge and integrate DGs formally into the community. Well done to those who persevered to press through the red tape now, as well as earlier to actually formalize the AKVE qualification. Is there a proposed design anywhere? Check the Stolen Valour Canada website. I'm sure one will pop up there within days. There's a guy in a NDHQ cubicle with a stack of these, taking a black magic marker to the "RCAF"
Few pictures of the interim badge here (RCAF FB Page article). They look similar to the Tac Hel Observer ones (attached pic from 265), but I've not seen anything on the proposed one yet that is big enough to see what the design actually is. Hopefully it stands out from the others. Interim CAG ones look like the stitching is done in the high-vis type. Last morning prayers I was at, the SCWO said the RCAF didn't approve that badge color scheme yet. 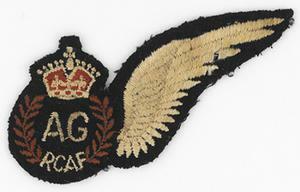 So it is great to see the RCAF issuing them! Looks like CP Gear has it. With this addition, maybe they'll take the time to review the CFAO, make amendments and supersede with a DAOD / port it into 265?